The Aztec are a country located in Central Mexico. It is also the primary nation of the Aztec culture. There is a group of events dealing with Altepetls revolts that fires cyclically and forces the player to deal with the danger of revolts. Other events concern some flavor aspects of Aztec nations, granting four permanent modifiers (first one is mandatory, others are optional). Sunset Invasion relies heavily on the El Dorado expansion, which adds additional events and religious mechanics for Aztec. It is important to understand the Nahuatl Doom mechanics, as they can take some time to learn. In order to enact Nahuatl reforms, you must have five vassals, and each time a reform is passed, all vassals will be released. Additionally, Doom must be below 50, and while Doom constantly ticks up, the best way to reduce it is by defeating enemy armies. For these reasons, the player must learn to ignore aggressive expansion, vassal liberty desire, and manpower. To succeed as Aztec, the early game is a perpetual state of war. Estates are useful for recruiting generals and generating gold or monarch points. Close attention should be paid to Estates, as Aztec has several events that modify loyalty and influence, allowing the player to receive frequent benefits. Managing Doom is the most difficult aspect to learn when playing as Aztec. The player should take every event that reduces Doom, as well as events that give permanent bonuses until the end of game, no matter the monarch point or gold cost. Aztec is lucky to have a 3/4/4/0 ruler general, which is the only military advantage to start. Immediately build to the force limit and set rivals that have Aztec as a rival. At least one neighbor should be available to ally, preferably one that rivals and borders an Aztec rival. A merchant should be sent to collect trade in Mexico, while the other merchant should sit idle. Set monarch point focus to military and hire a military advisor, especially one that gives combat bonuses. Having an advantage in military tech will be key to defeating enemies after the first couple of wars. The player should also extract as much money in peace deals as possible, to support reinforcements, advisors, and mercenaries. The first war tends to be the most difficult, and may require a few starts to achieve success. After winning the first war, the player should immediately find another target, again by promising land to an ally, or finding an enemy with only a single ally. Vassals will typically not be of assistance in wars, except to distract enemies and defend their own lands. In addition to managing Doom by events, Doom can be reduce by defeating enemy armies. A good way to do this is to stackwipe large armies with superior army quality, but Doom can also be gamed by leaving one or two enemy provinces unoccupied while sieging their capital. Enemies will continue to recruit mercenaries, which can easily be wiped out to reduce Doom in small increments. This same strategy of blitzing enemies should also be used for the next few reforms, and each reform will be easier to achieve, as Doom will tick more slowly and Aztec's military tech will quickly outpace neighbors. After a few military tech levels, manpower will become irrelevant, as an Aztec army of 10k should be able to stackwipe an enemy army of 10k easily. With each reform, the player can annex more territory without worrying about Doom. The player could also expand towards Xiu, Itza, and Kichu for additional war targets to cycle through. Truces mary be gamed by declaring war on enemies allied to truce targets. Aggressive expansion and liberty desire can be ignored, as enemies will perpetually cycle through truces and never be in a position to fight back. With an aggressive strategy, the player should be able to enact all five reforms around 1500, after which point Doom will be irrelevant and the player can consolidate Central America while waiting for the Europeans to arrive. In order to enact the final reform, Aztec must directly border a European nation's core province. This will take some time, so the player should consolidate power in Central America. Aztec's neighbors should be easy targets for conquering, but Cocomes makes for a good ally at this stage, as they will most likely not border Aztec, and will help with expansion into Mayan lands. Managing inflation is a constant struggle with Aztec, so the player should hire a Master of Mint whenever possible. Also, Aztec can protect itself from inflation by pawning gold provinces off on a vassal. The player should consider vassalizing Tlapanec and feeding it Coloyopan, another gold producing province. As Aztec does not have any easily accessible neighbors outside of Central America, vassals will also help provide manpower and armies once war with Europeans occurs. 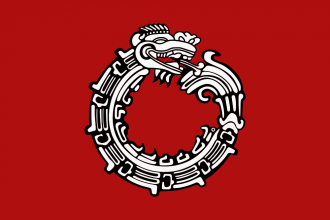 After sufficiently expanding North and South (be sure to take Iximche or Chacujal for Southward expansion), the player should remove focus from military technology and work to admin level 5 to gain an idea group. Exploration ideas is a good first group to take, as it will let the player recruit Conquistadors (Explorers and boats will not be available until the final reform is passed). The conquistador should be used to explore as much of South and North America as possible, to find European settlements. Europeans will most likely settle in Colombia first, but may occasionally head to Mexico immediately. While waiting on European contact, and with no more enemies, Aztec's one (or two) colonists should be put to work expanding southward. Without boats, Aztec can only colonize directly adjacent land, so it is unlikely that Colombia can be reached before European contact. To bypass this slow growth, a no casus belli war against Muisca or Carib can quickly launch the player to South America and serve as another location for colonization (assuming they have colonized the coastline). Once European contact is made, the final reform will allow Aztec to quickly catch up in technology. An Explorer should be recruited to discover the Caribbean, and colonists should target the development-rich provinces there, especially the Windward Islands. With a large development pool from colonization, it is highly likely that Aztec will quickly be a Great Power, allowing for victory against European Powers. It is also recommended to colonize the Panamanian Isthmus for its trade power, but also as a choke point with rough terrain for enemy colonies in South America. Once a sizable development base has been built, it will be time for Aztec to set its sights on Europe. It may also be prudent to remove the Exploration idea group once enough provinces have been discovered (including Europe) and the Caribbean colonized, which will allow for more useful ideas to be selected. Once Aztec owns cores with European religions (Islamic and Christian sects) the player will have the option to convert. The benefits of converting must be weighed against the cost, but generally conversion is not necessary. Once Aztec is strong enough and has a core in Europe, the European powers will be open to alliances even with religious differences. Either way, Humanist Ideas will be essential to maintaining religious unity as more and more Christian provinces are taken.